This is really largely an exercise in three-dimensional visualization–that’s the hard part! But without some effort to see the big picture, you will not be able to appreciate some really nice things, like the phases of the moon, eclipses, and even just the seasons. You really need to have a clear picture of the Earth orbiting around the Sun and at the same time rotating about an axis tilted relative to the plane the orbit lies in, with the axis of rotation always pointing at the same star, and not changing its direction as the Earth goes around the Sun. Then you must add to your picture the Moon orbiting around the Earth once a month, the plane of its orbit tilted five degrees from the plane of the Earth’s orbit around the Sun. Then we add in the planets…. There is one star that always stays in the same place in the sky, as seen from Charlottesville (or anywhere else in the northern hemisphere). This is Polaris, the North Star. All the other stars move in circular paths around Polaris, with a period of 24 hours. 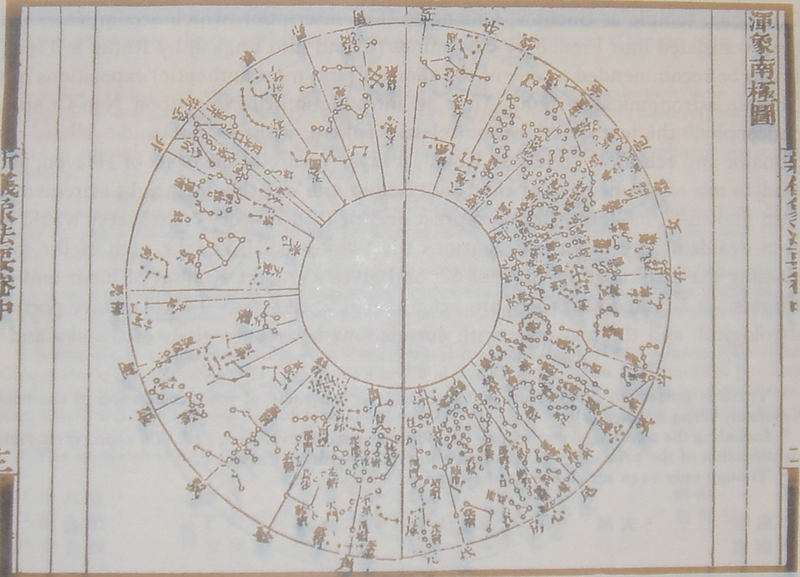 This was understood in ancient times by taking the stars to be fixed to the inside surface of a large sphere, the “starry vault”, which was the outer boundary of the Universe, and contained everything else. 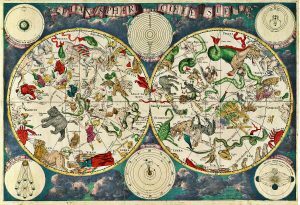 Of course, we only see the stars move around part of their circular path, because when the Sun comes up, the bright blue scattered Sunlight–the blue sky–drowns out the starlight. If there were no atmosphere, we would see the stars all the time, and see the complete circles for those that stayed above the horizon. If you were at the North Pole in the middle of summer, lying on your back, you would see the Sun go around in a circle in the sky, anticlockwise. The circle would be centered on Polaris, which is directly overhead, except for the fact that you wouldn’t see Polaris all summer, since it wouldn’t be dark. Here of course we see the Sun circling part of the time, and see Polaris the other part of the time, so it isn’t completely obvious that the Sun’s circling Polaris. Does the Sun circle clockwise or anticlockwise for us? It depends on how you look at it–in winter, when it’s low in the sky, we tend to look “from above”, see the Sun rise in the east, move in a low path via the south towards the west, and that looks clockwise–unless you’re lying on your back. It turns out that the Sun moves almost exactly one degree per day against the starry vault, so that after one year it’s back where it started. This is no coincidence–no doubt this is why the Babylonians chose their angular unit as the degree (they also liked 60). The motion of the Sun across the starry vault has been known at least since the Babylonians, and interpreted in many colorful ways. 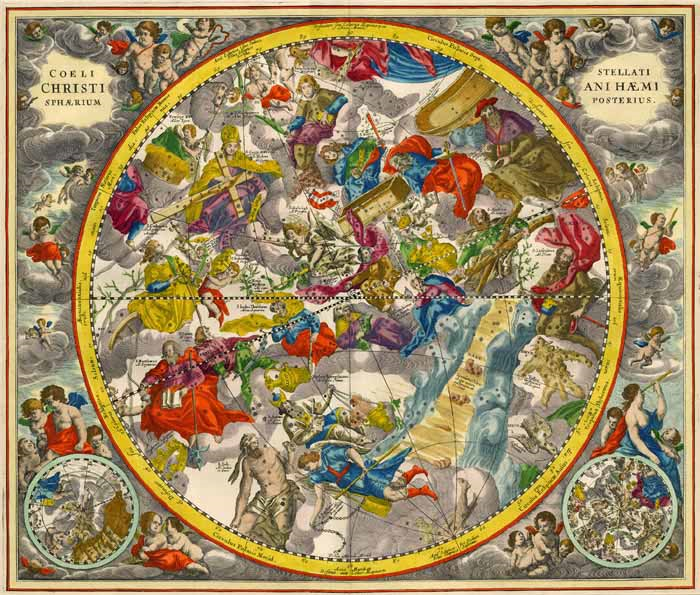 Compare our present view of the stars, thermonuclear reactions in the sky, with the ancient view (see Hemisphaerium Boreale, Appendix to Heath’s Greek Astronomy). 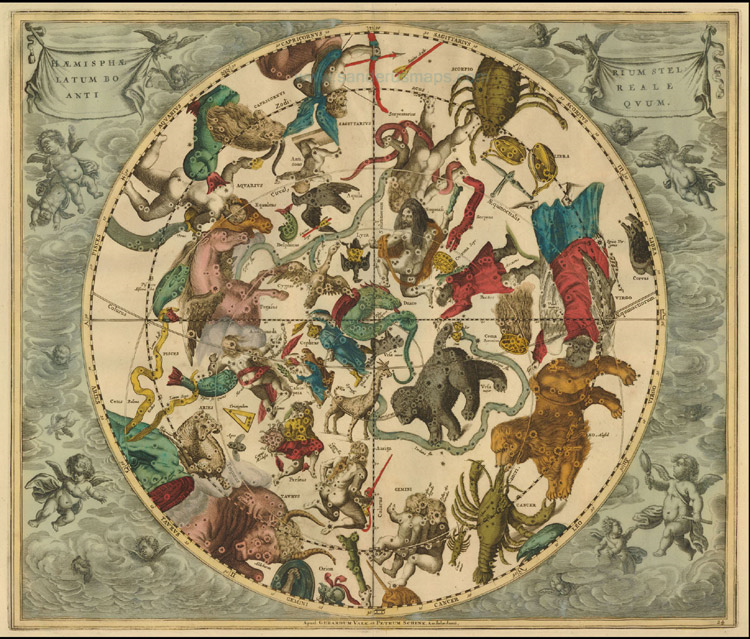 The Sun’s path through all this, the ecliptic, endlessly repeated year after year, and the set of constellations (the word just means “group of stars”) and the animals they represented became known as the Zodiac. ( ” zo” being the same Greek word for animal that appears in “Zoo”.) So this is your sign: where in its path through this zoo was the Sun on the day you were born? 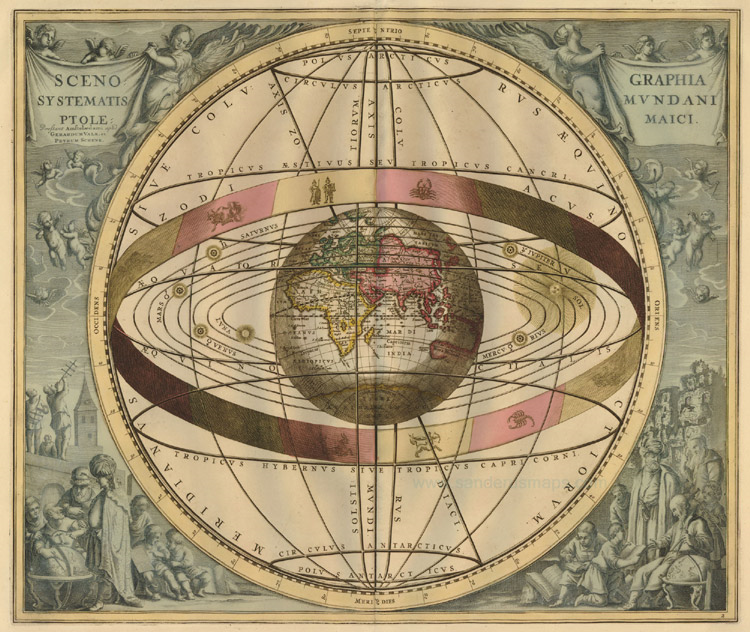 Notice that the print shows the Sun’s path through the northern hemisphere, that is, for our summer. 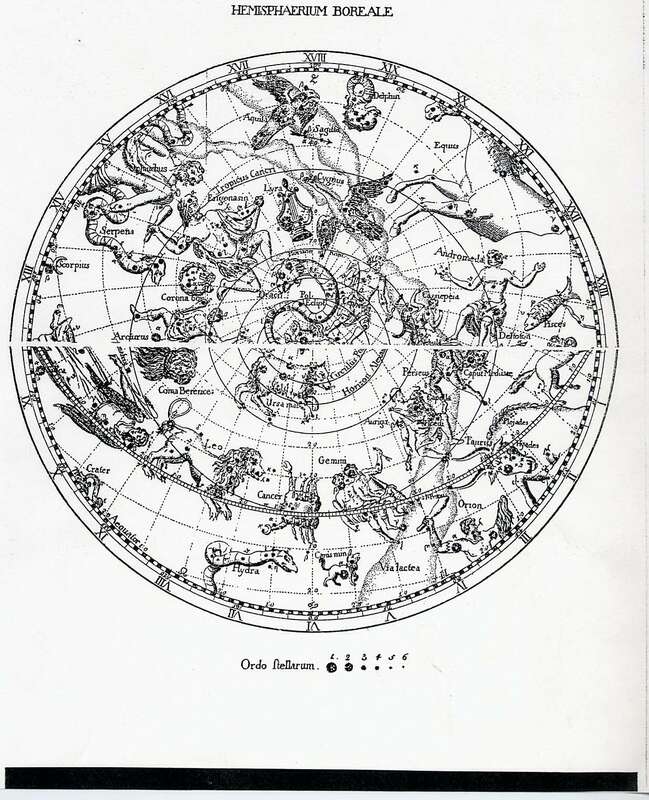 The furthest north (closest to Polaris) it gets is on June 21, when it is in Cancer, it is then overhead on the Tropic of Cancer, 23.5 degrees north of the Equator. In other words, the spherical Earth’s surface is visualized as having the same center as the larger sphere of the starry vault, so when in its journey across this vault the Sun reaches the tropic of the vault, it will naturally be overhead at the corresponding point on the Earth’s tropic which lies directly below the tropic on the vault. 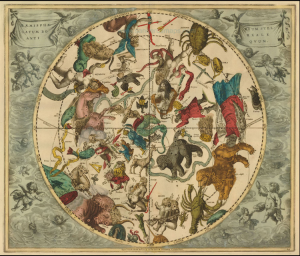 Above is a more spectacular demonstration of the same thing: notice, for example, the Plough (also known as Ursa Major, the great bear) in the tail and body of the bear, and the familiar astrological collection of animals around the zodiac. The answer is no, but it’s close. 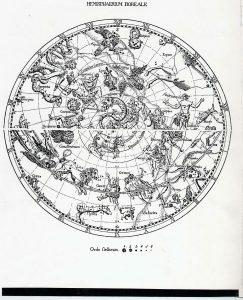 It always stays within 5 degrees of the ecliptic, so it goes through the same set of constellations, “the Moon is in the Seventh House” and all that. 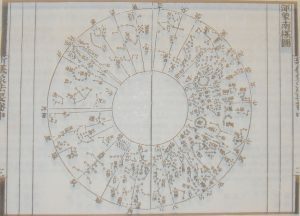 In fact, the “houses”–the signs of the Zodiac–are defined to occupy a band of the stars that stretches eight degrees either way from the ecliptic, because that turns out to be wide enough that the Sun, Moon and all the planets lie within it. How can we understand the Moon’s motion from our present perspective? If the Earth, the Moon and the Sun were all in the same plane, in other words, if the moon’s orbit was in the same plane as the Earth’s orbit around the Sun, the Moon would follow the ecliptic. In fact, the Moon’s orbit is tilted at 5 degrees to the Earth’s orbit around the Sun. This also explains why eclipses of the Moon (and Sun) don’t happen every month, which they would if everything was in the same plane. In fact, they only occur when the moon’s path crosses the ecliptic, hence the name. 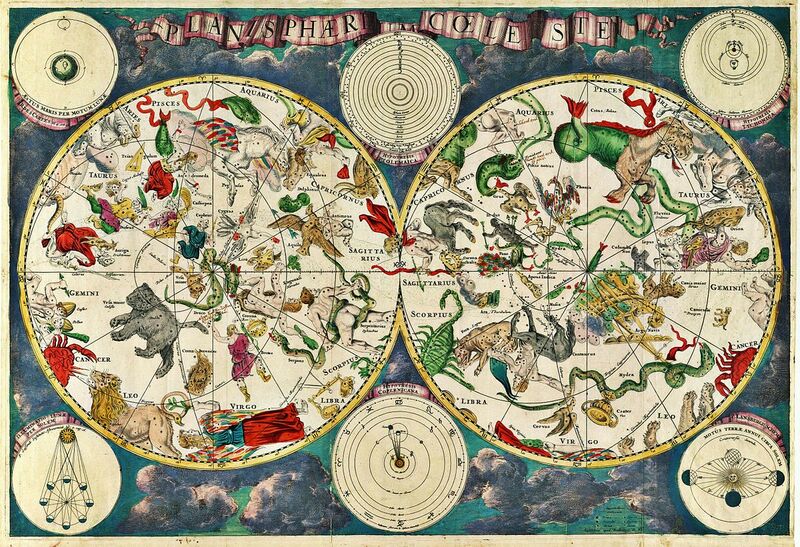 Since ancient times it has been known that five of the “stars” moved across the sky: Mercury, Venus, Mars, Jupiter and Saturn. They were termed “planets” which simply means wanderers. The other planets are not tethered to the Sun in the same way, but they also have some notable behavior–in particular, they occasionally loop backwards for a few weeks before resuming their steady motion. 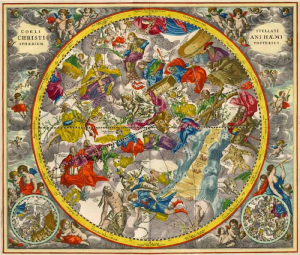 Cultural note: an attempt was made about the same time by Julius Schiller to replace the barbaric twelve signs of the zodiac with the twelve apostles (image above). This entry was posted in Ancient, Astronomy, Cosmology, Egypt, Greece, Greek, History. Bookmark the permalink. ← Santorini Eruption: Did Pyroclastic Flows Cause Devastating Bronze Age Tsunamis?